This post is sponsored by Boar’s Head. All opinions are 100% my own. Mini Hummus Phyllo Bites are an easy-to-make appetizer that’s perfect for parties! Your guests will rave about them for months to come! Easy appetizers are my favorite thing to make for parties. Whether it’s appetizer dip recipes, great deviled eggs, or a poppable bite anything I can make or prep in 15 minutes or less is a must make! These mini hummus bites are my new favorite appetizer. Crazy easy to make and so incredibly tasty!! One bite and you’ll be hooked! Hummus is my go-to snack any time of day. My standard morning ritual is to drop the boys off at school, come home, grab some water, the pretzels, and a tub of hummus and start my work day. When I found out one of my favorite brands for quality and taste came out with a line of hummus I had to try it. Boar’s Head hummus did not disappoint kids. It’s seriously hummus to a higher standard. I’m totally smitten and know you will be too. Most hummus brands I’ve tried taste like hummus that has a flavor. With Boar’s Head, it’s a burst of authentic flavor and then “oh yeah, it’s hummus!” which is my favorite thing every when eating something that comes in flavors. The roasted red pepper hummus crushed my usual hummus brand and the fire roasted artichoke & spinach hummus is my new addiction. Boar’s Head hummus is all about amazing tasting hummus that’s sure to become the only brand you’ll want to eat! I wish I had taste-o-vision…or something like that…so you could try it right now. I’m a full on convert. These hummus bites are an extension of my new love for the Boar’s Head line and they’re so yummy! 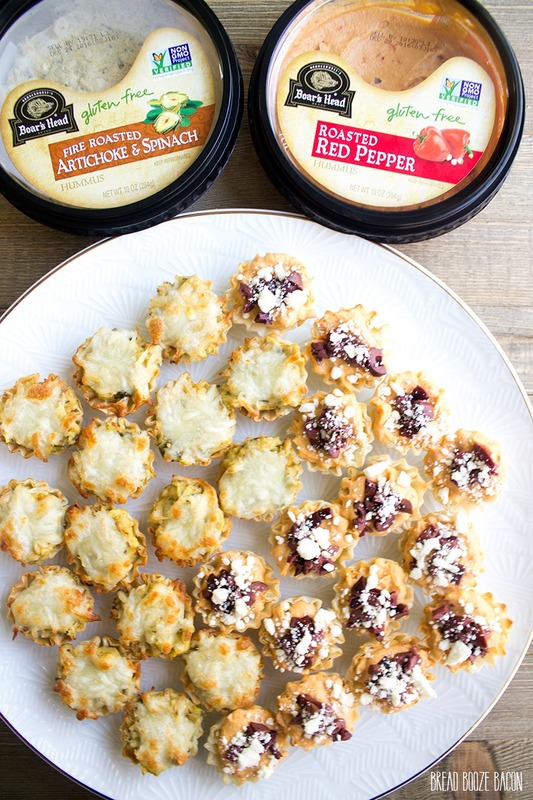 The Mini Spinach Artichoke Hummus Phyllo Bites are a lightened up spin on everyone’s favorite spinach artichoke dip, and the Mini Roasted Red Pepper Hummus Phyllo Bites are a dream for anyone that loves Mediterranean flavors. Both recipes can be ready in 15 minutes or less and are such a great option when company shows up last minute. Just keep a tub or two of Boar’s Head hummus in the fridge and you’ll be ready to entertain in a moments notice. 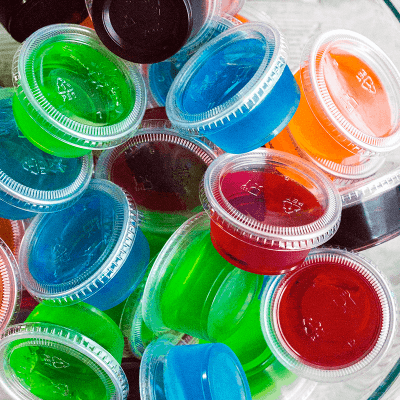 With flavors like these, your guests will totally think you’re a wiz in the kitchen! For more holiday entertaining inspiration, visit the Boar’s Head Hummus website. 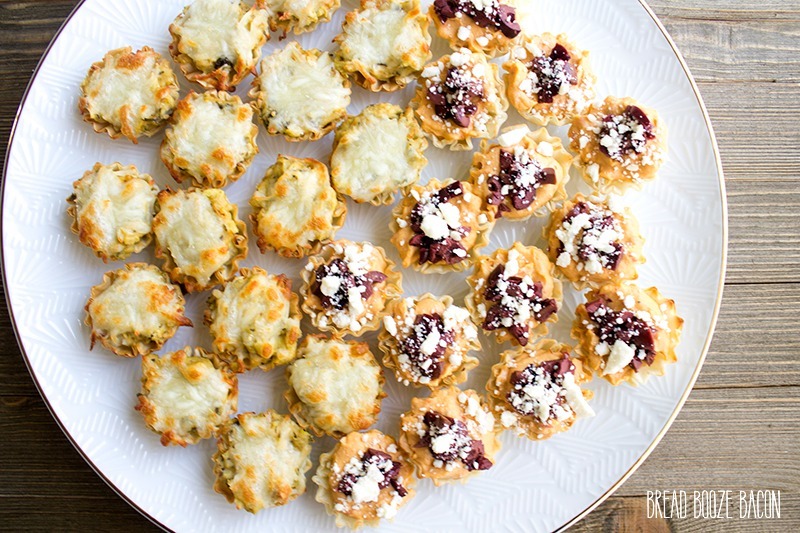 Mini Spinach Artichoke Hummus Phyllo Bites are an easy-to-make appetizer that's perfect for parties! Your guests will rave about them for months to come! Scoop the hummus into a medium mixing bowl. Pour in the chicken and artichoke hearts. Stir until combined. Use a spoon to portion the hummus mixture into the phyllo cups until they are just filled. Place the phyllo cups on a foil-lined baking sheet. 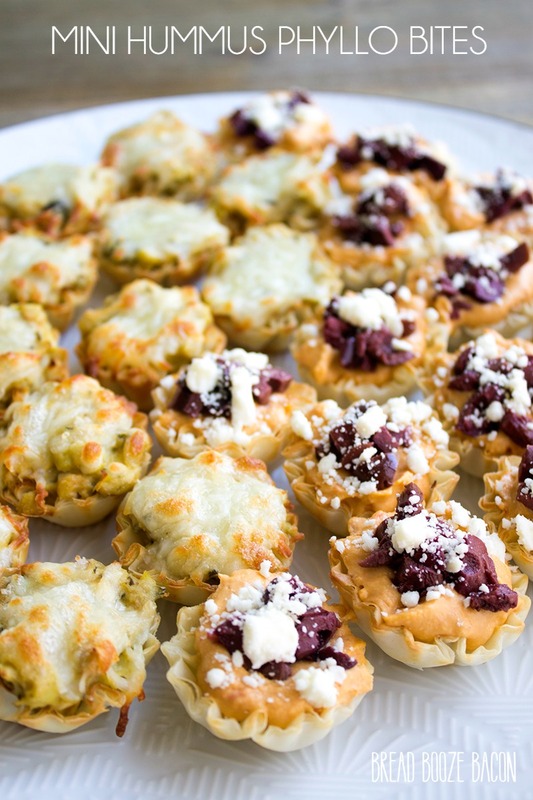 Sprinkle each phyllo cup with mozzarella cheese. Bake for 3 minutes or until the cheese begins to melt. Turn your oven to broil and cook for 2 minutes or until the cheese finishes melting and is golden. Remove from the oven and transfer to a serving plate. Serve immediately or at room temperature. Prepared phyllo cups are available at the grocery store.